We started off our last day with a bang, literally. When we arrived at the Walsh-Alberici joint venture project office, the senior project manager, Eric Hayes, started his presentation with videos of the demolitions of the westbound Blanchette Bridge and the Allegheny River Bridge. After captivating our attention and feeding us a tasty breakfast, Mr. Hayes continued his presentation with information about their joint venture. 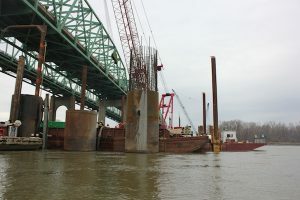 With Burns and McDonnell as their designer, Walsh and Alberici came together as a joint venture to bid for MoDOT’s Daniel Boone Bridge project. This Design-Build project had several requirements for bidding; the proposed design required a new Missouri River bridge that connected St. Charles and St. Louis counties, a replacement of the existing bridge built in 1935, a shared use path connecting KATY Trail State Park to the Monarch Levee Trail, an improvement of the Chesterfield Airport Road interchange, and a completion date as late as July 1st, 2016. MoDOT’s budget for the proposed project was $117 million, but the bids were not chosen solely based on the cost. 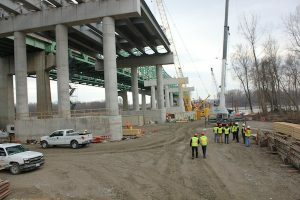 With the $111 million proposed bid from this venture, Walsh-Alberici decided to go above and beyond by making a fourth lane bridge with a bike path, adding a loop around a rock quarry for the KATY trail connection, rehabilitating the existing 1980’s bridge, raising the Spirit Boulevard Bridge two feet, and estimating a finish date of December 31st, 2015. 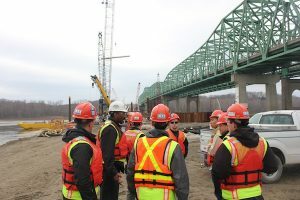 This design-build project involved work on three separate bridges. The assistant project manager, Ethan Kaufman, presented the work on the Spirit Boulevard Bridge, the Chesterfield Airport Road Bridge (CAR Bridge), and the Main River Bridge. The Spirit Boulevard Bridge would get hit by trucks on a regular basis due to its low clearance. 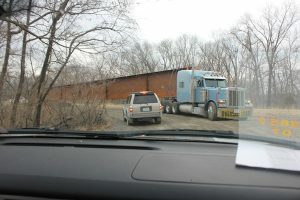 A normal interstate should have a 16-foot clearance, and due to the complaints, Walsh-Alberici added this $700,000 project to their bid. 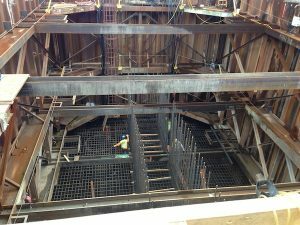 Using a total of 35 jacks and 2 pumps at five locations, the bridge was raised at half inch increments. This bridge had to be monitored very closely as the bridge deck was still in place. The jacks had to be within 1/8” apart to avoid cracking. 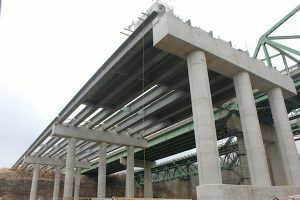 After the bridge was raised 24”, it had to be raised a little more to allow space for the precast concrete blocks to be placed at each bearing location. This 30 day closure used the slightest part of the total bid, but it created a great value to the drivers on the road. The CAR Bridge was an interesting project as part of the existing bridge had to be cut out in order to properly align the road. Using precast erections, six 70,000lb girders were placed over a weekend long closure. As safety is always a big concern for Walsh, the lanes below the bridge were closed while the concrete was being poured for the bridge in case there was any leakage. The Main River Bridge is a third bridge to run parallel to two existing bridges, the older of which was to be demolished and replaced with this new bridge. Running 2600 feet with four lanes, two shoulders, and a bike path, this bridge was the main purpose of the MoDOT project. 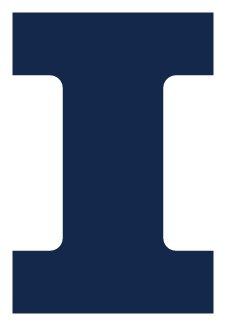 The project is currently on time, but double shifts are required due to the horrid winter this past year. There were some days that it was too cold to start the equipment and days where huge chunks of ice would be floating down the river. We were lucky to be able to take a walk around the site and take a short boat tour around the construction.